Shelters For Immigrant Teens Expanded As Record Numbers Continue To Cross Over 12,000 immigrant teens are being held in shelters across the country. Record numbers continue to cross and the government is expanding shelter capacity to hold them. A West Texas tent shelter for unaccompanied minor immigrants in Tornillo, Texas. The government announced this week that the camp is expanding from 1,200 to 3,800 beds to accomodate an increasing number of immigrants crossing the border. The Trump administration is expanding its shelter capacity to handle a record number of immigrant teenagers who crossed the border seeking work and asylum. The Department of Health and Human Services (HHS) is now overseeing the care of 12,800 immigrant children under the age of 18. 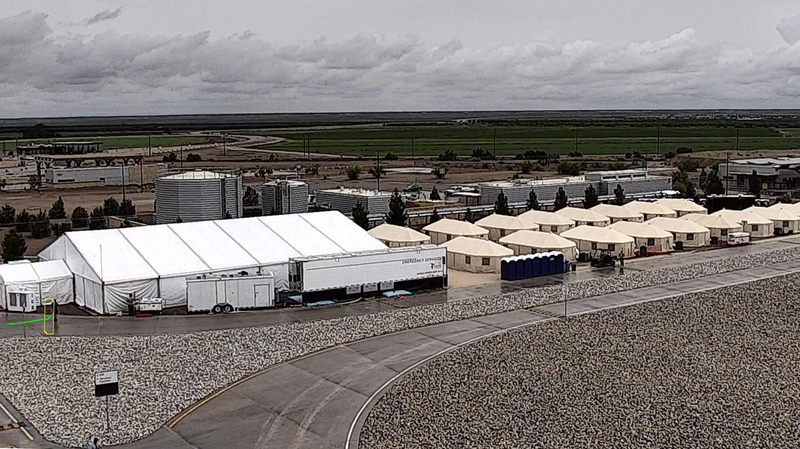 Just this week, a federally contracted tent camp on the U.S.-Mexico border in the barren desert near Tornillo, Texas, announced it is expanding from 1,200 to 3,800 beds. This is one in a network of 100 youth shelters across the country. Shelters for minors are, by far, the most expensive type of immigration custody provided by the U.S. government. Detaining a mother and child runs in the range of $320 a day in what Homeland Security calls a "family residential center"; beds for unaccompanied children exceed $600 a day, when security, education, counseling, medical care and recreation are factored in. The great majority of the 12,800 children crossed into the United States alone, without an adult. Some 560 kids in the shelters were separated from their parents under the president's "Zero Tolerance" policy and have not yet reunited with their families. HHS is overwhelmed with immigrant teens for two reasons. First, new figures released Monday by Customs and Border Protection show the flow of unaccompanied minors crossing the border continues unabated. In August, immigration agents apprehended 4,396 kids traveling alone, or about 140 a day. That's 12 percent higher than July, and nearly 50 percent higher than the same period in 2017. Second, there is a bottleneck in releasing the children from the shelter system to go live with sponsors. It's like having a restaurant where people keep coming in the door, but no one leaves. Unaccompanied immigrant children are allowed to go live with family members already in the U.S. But HHS has tightened vetting processes for relatives who want to act as sponsors. Now, everyone in the household, not just the potential sponsor, has to be fingerprinted and undergo a criminal background check. "The background checks are taking forever," said the shelter manager at Tornillo, who works for the nonprofit BCFS. He asked not to be named. "It's like having a restaurant where people keep coming in the door, but no one leaves." HHS released a statement: "Because children who enter the country illegally are at high risk for exploitation by traffickers and smugglers ... HHS maintains high standards for vetting childrens' sponsors for the safety and well-being of the child." The statement adds, the numbers of unaccompanied children and families unlawfully crossing the border constitute a "symptom of... a broken immigration system." Megan McKenna, spokesperson for Kids In Need of Defense, (KIND), an immigrant advocacy group, points out that HHS has begun sharing sponsor information with immigration enforcement agents. "That's having a chilling effect on people willing to come forward to claim their child because the sponsor and others in the household may be undocumented," says McKenna. The average length of stay for kids in federally contracted shelters has grown from 37 days in 2015 to 59 days at present, according to HHS. Based on interviews with youngsters released from shelters, "They express a lot of fear. They don't know what's happening to them. They don't know when they're going to be released," McKenna says. "It's incredibly damaging to the kids."